Cornwall Air Ambulance is launching its Make a Will Week (10th- 14th September) when solicitors across Cornwall will waive their fee for basic Will writing or amending of existing Wills, in return for a donation of their fees to the charity. Supporting Cornwall Air Ambulance with a gift in your Will is a pivotal decision that provides the fuel that powers the helicopter for our lifesaving missions and funds the medical equipment that helps the paramedics deliver the best treatment they can. 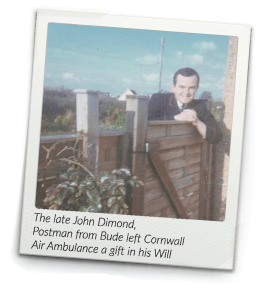 The late John Dimond, from Widemouth Bay in Bude, made that decision by leaving a gift in his Will to help Cornwall Air Ambulance continue its lifesaving work. John worked as a postman most of his life and spent his spare time in the garden, growing rhubarb, blackcurrants and blueberries. John chose to leave a legacy to the charity to help to give more people the gift of time, will you? One in every three Air Ambulance rescue missions is funded by people like John, who want to help try to save lives in Cornwall for future generations. Debbie Henshaw, Cornwall Air Ambulance Trust’s Fundraising Manager- Philanthropy said: “We know how difficult it can be for people who are busy leading their lives to think about what might happen after they die. “However, it can bring real peace of mind to ensure that you once you are gone you have safeguarded the future of your family and loved ones and your favourite good causes. 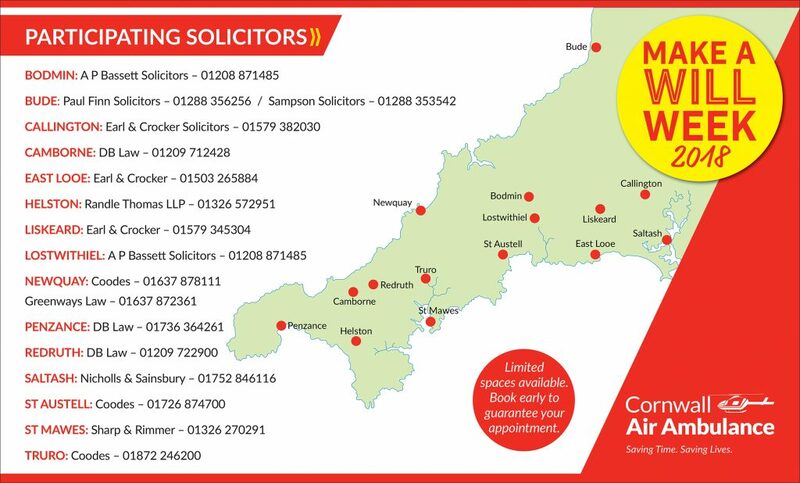 Solicitors charge, on average, between £175 and £350 to draft a Will, so your generous donation, in lieu of their fees really will help Cornwall Air Ambulance to keep flying and saving lives.